After a fabulous time in Scotland it was time to move down to London. It was April 28 and the Royal Wedding was just one sleep away! To get to London I was using the services of British Airways and flying into Heathrow. My original plan had me flying in to London City airport as its something I always wanted to try but when comparing flight prices, Heathrow was less than half the price so I went with that. I chose flight BA1439, the 9.20am departure scheduled on an Airbus A319. I stopped by the premium check-in zone for British Airways (making use of my oneworld Emerald status) and was greeted by an extremely unfriendly female check-in agent. Well, I was being too kind when I say I was greeted, more like I was barely acknowledged and considered an inconvenience. Time for this staff member to find alternative employment I think. Anyway - my bags were checked through and I was given my boarding pass. I had been able to select a window in the second row which was nice, presumably due to my frequent flyer status. I made my way passed the hoards of low cost carrier passengers who were standing in what seemed like endless queues and on through security. Once through it was off to the BA lounge for breakfast. Well - the lounge wasn't exactly fabulous but at least it appeared clean, modern and comfortable. 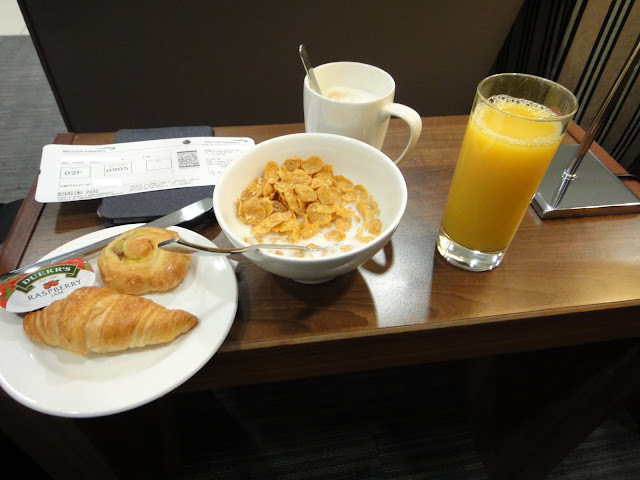 There is no hot food selection, instead there is a bunch of continental breakfast type items such as croissants, cereals, juice and coffee. Seeing lounges like this makes me so thankful we have Qantas business lounges in most major Australian domestic ports with a much more vast food selection and real coffee made by a barista. Anyway, as I had plenty of time I fixed myself a plate and got comfortable. Eventually it was time to head off to the gate where I found the fog had dissipated and Airbus A319 G-EUPD was waiting. This was to be my second ride on an A319 ever. G-EUPD was delivered new to BA in December 1999, making her 11.5 years old. British Airways operate service from Edinburgh to 3 airports in London: Heathrow, Gatwick and London City. Parked beside us was a Boeing 737-400 bound for Gatwick, and a BMI airbus also bound for Heathrow. Boarding was soon over and we made our way to the runway and launched out over the water before making some left hand turns and heading towards Glasgow. Around that area we finally made another left turn and headed south. I had read on a few other peoples trip reports that BA offers a hot breakfast on its morning domestic flights, but since this was a 09.20am flight I had expected it would be too late for breakfast and expected some sort of morning tea item like a biscuit or muffin. I was surprised though that during climb I could smell food being warmed up from the galley, and it smelt quite breakfast like! Sure enough, we were each soon presented with a full hot breakfast consisting of egg, bacon, sausage, mushroom along with a roll and juice. I have to say I was quite impressed and I was glad I didn't fly on BMI who operate a buy on board service on domestic. Leg room - quite generous! The captain actually announced we would be flying in a holding pattern awaiting a landing slot at Heathrow and we started making right hand orbits. I noticed a BMI aircraft through my window doing the same thing at a slightly higher altitude than us. The delay was very short though and within a few minutes we continued towards Heathrow and made a landing on runway 09L on what was quite a cloudy day. We made a quick taxi back to the northern side of terminal 5 and parked in what I can only assume was the domestic area, although I'm sure it can be used for international too. Disembarkation was very quick from the second row and I was soon at baggage reclaim awaiting my bags. Well I had made it to London... it was April 28 and the wedding was just one day away. Time to check in to the hotel and get familiar with the area around the palace in preparation for tomorrow! Yes, it only takes a few few flights in Europe or the UK to appreciate the quality of QF lounges! The lounges in the UK are improving but slowly, I only fly Virgin because of their lounge out of Heathrow... exceeds the other carriers by miles.